When one spends more time writing comments for French on-line journals, rather than trying to write articles for one's own 'page', it's a sign of the times. They are certainly not inspiring times, but they are constantly perturbing. We thus like to foster illusions that our modest opinions might contribute minutely towards swaying the balance. If ignorance is bliss, naivety must also be comforting. Yet in spite of the weight of public opinion, (for naturally there are many commentators who share the same views and concern) the unrestrained situation continues to deteriorate. It seems that the French always find a knack of becoming their own principal enemy. Finally persuaded by certain media and what seemed to be a preconceived press campaign of systematic anti Sarkozyism and a fabrication and promotion of F. Hollande, (but above all of socialism) they ended up by electing an impostor as their President. 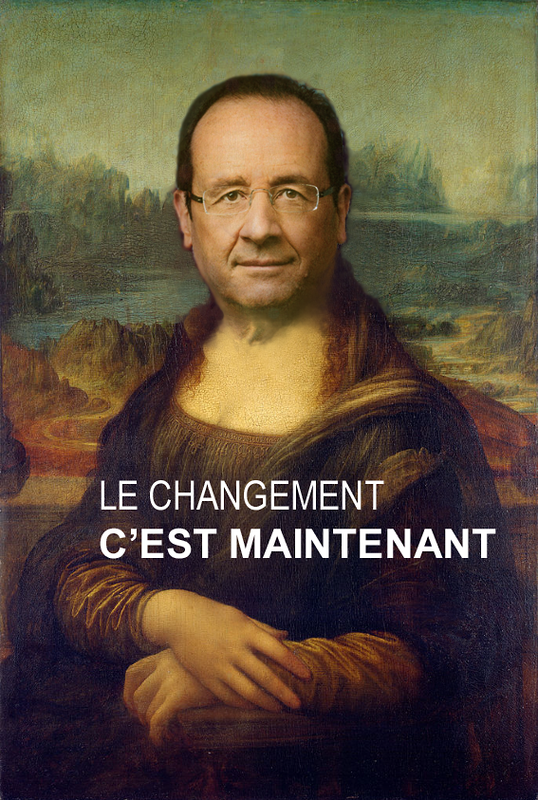 Monsieur Hollande has proved himself to be worse than even anticipated. It follows that the situation is also worse than anticipated. Consequently there has never been a French President as unpopular as he has become. As enough has already been written on why François Holland has proved to be a greater disaster than thought possible, it would only add to the tedious depression to dwell on this, especially as the absurd aspect of it all is no longer amusing. The ironic tragedy however is that since Nicolas Sarkozy has quit the political scene, the main opposition party, l'UMP (Union pour un mouvement populaire) has virtually disintegrated. One could conclude that had the UMP the intention of destroying itself whilst fully allowing a Tartuffe unopposed freedom of ruining the country, it couldn't have done a better job. Naturally the French have since grasped the fact that electing F. Hollande was a gigantic faux pas. Social incongruities and superficialities, a manipulated justice system, over taxation, negative economic results and ever increasing unemployment have created a climate of division, distrust, anger and frustration. As there is no rational opposition recourse, the extreme right wing movement, Le Front National, has manoeuvred itself to fill the vacuum, but it is considered more as a means to express anger and frustration, than as an alternative political choice of any credibility. In fact it's likely that those who voted FN for the European elections don't even know the political program of the party. One wonders if the members of the FN know this themselves, because when one succeeds in obtaining a token of information regarding the party's economical policy for example, it brings to mind 'Brazil', Orwellian nightmares, or the worst periods of soviet communism. Once more we are reminded that the politics of the extreme right and the extreme left wings amount to the same form of camouflaged totalitarianism. Of course the alleged popularity of the FN brings crocodile tears to the eyes of rich, phoney stage artists who unashamedly follow the Hollande cortege for personal gain whilst they avoid paying French tax. Yet incredibly these so-called artists are still rated as popular, no doubt by the same media and opinion polls who unashamedly launched the Tartuffe. If nothing had been accomplished in France since the election of Monsieur Hollande, one would at least be comforted by the thought that nothing has changed. But the situation has changed. It's far worse than ever. F. Hollande is undeniably podgier, but essentially he hasn't otherwise changed. He is as immutable as a worthless icon of dated ideology. He who advocated 'Le changement', seems blissfully unaware of the ruins he is leaving in his wake as he serenely advances nowhere.